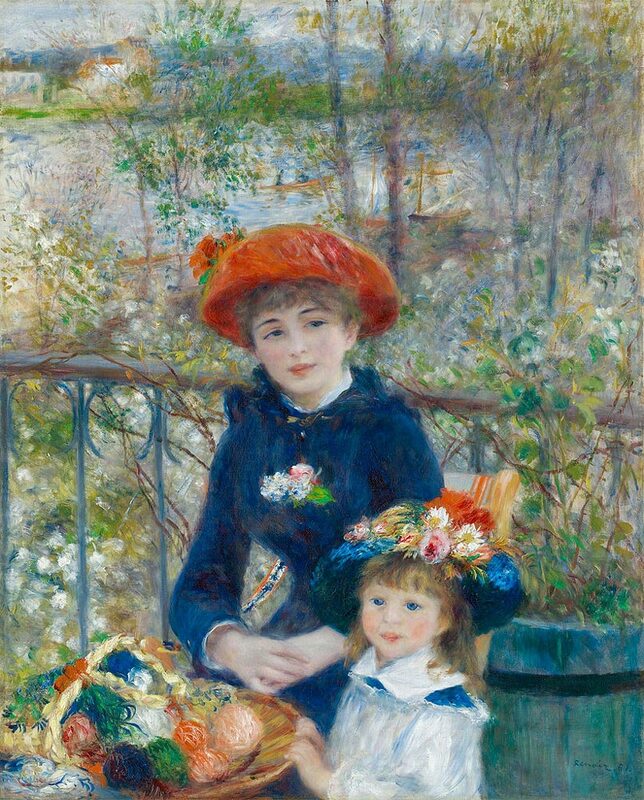 Two Sisters (On the Terrace) created by Pierre-Auguste Renoir is one of the most well known painting in the world. Originally titled Two Sisters, this painting was given the second title of On the Terrace by an art dealer. Renoir painted this masterpiece at Chatou, which was a suburb of Paris where he spent much of his time. The background of the painting was inspired by the wooden banks of the river in this area. He painted the piece at Maison Fournaise, which is where he had created a different piece before. It’s believed to have been created in 1881. Jeanne Darlot was revealed to be the older sister in the painting, while the younger sister is unidentified. Renoir used oil on canvas to make this 100.5 x 81 cm painting. The two young girls on the front are wearing beautiful hats with long dresses. There are sparse trees in the background surrounding a river when the sun appears to be diminishing. I have a 1978 poster print of this painting and was looking to see if there is any resale value to it. It is a beautiful picture. Thanks Brenda for the immediate response, Actually Helping sister-in-law that had purchased painting with beautiful Frame…. Later realize there was Renoirs two sisters behind front painting. Trying to seek advise on further information regarding such findings, Thank you very much OH YES Such a Beautiful Creation!!!!! !